Maarten Regtien traverses a glacier during an eight-day trek on Spitsbergen, after which the pianist played an evening concert in Longyearbyen followed by another nine-day trek. He wrapped sports tape around his fingers to protect them during the trips. Photo by Gert Van Es. Runners hardly expect to post record times during the North Pole Marathon, so Maarten Regtien deserves some slack if he wasn't at his peak coming straight to the piano after an eight-day trek in the Arctic cold. With sports tape wrapped around his fingers while crossing glaciers and his mind on alert for polar bears, improvising a two-hour solo jazz concert on a less-than-perfect grand at Galleri Svalbard in Longyearbyen was more about wish fulfillment than virtuosity. "I'm a collector of things about the Arctic," he said, adding one of those was claiming bragging rights to playing the world's farthest-north piano. "I knew there was a governor here and I figured if they had a governor they had a piano." Actually there's more than one piano on Svalbard, including an ancient model he played in the abandoned Russian mining settlement of Pyramiden that may well be the world's northernmost (Regtien said its playability was lousy, hardly unexpected or a foremost consideration). 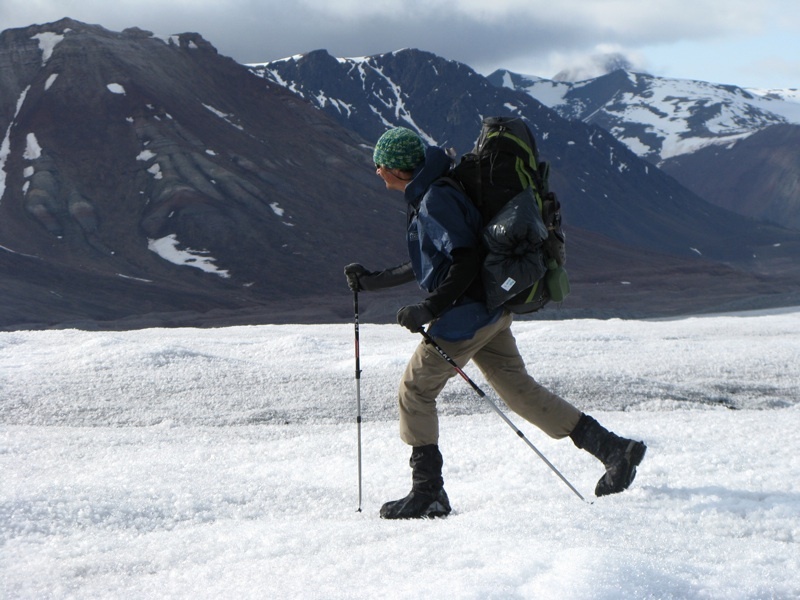 More proper was his July 22 Longyearbyen concert in a room-filling audience of about 50 people, including a large number of fellow trekkers, during the few hours he spent indoors before heading to a campsite and another nine days in the wild. Wearing a simple orange pullover and other casual attire, Regtien sat down and without a word launched into an opening half consisting of variations on common compositions from Beethoven's "Für Elise" to Miles Davis' "All Blues." "I always play to warm you up," he told the audience after his first song, talking them through the rest of the pieces ranging from personal longtime favorites to requests from his expedition group for something familiar. He returned after intermission minus the pullover and, while the audience was still taking their seats, launched into a 30-minute continuous free improvisation. "Even I don't know what I'm going to play and we all have to pray to God I sound nice," he told the audience. Regtien concluded the concert with a variation on "Memories of Tomorrow" by his mentor Keith Jarrett (trivia: the only winner of the Polar Music Prize not sharing the Swedish honor with another artist). Regtien showed the range of Jarrett's forays into jazz, classical, blues and beyond if not quite his edge - although the legend's habit of grunting while playing was also mercifully absent. To the casual ear there was little indication of a struggle in Regtien's evening-long mix of moody and playful sketches anchored by left-hand vamps and colored by dense chords, rapid stabs and right-hand note runs. The ambiance was also fitting, with black-and-white Arctic landscape photos lining the walls and strong winds outside permeating quieter passages. But Regtien was a harsher critic than his audience, saying he could feel the lack of practice after more than a week of traversing hills and ice fields. Plus the gallery's piano was a bit off despite some last-minute tuning he gave it. "It's not responsive to my quickness," he said in an interview during intermission. Plenty of those in audience apparently didn't notice or care, lining up to buy copies of - and get autographs on - Regtien's most recent album Improvisaties Piano Solo. The 2007 recording is his second unaccompanied project, coming 14 years after the similarly titled Piano Solo. 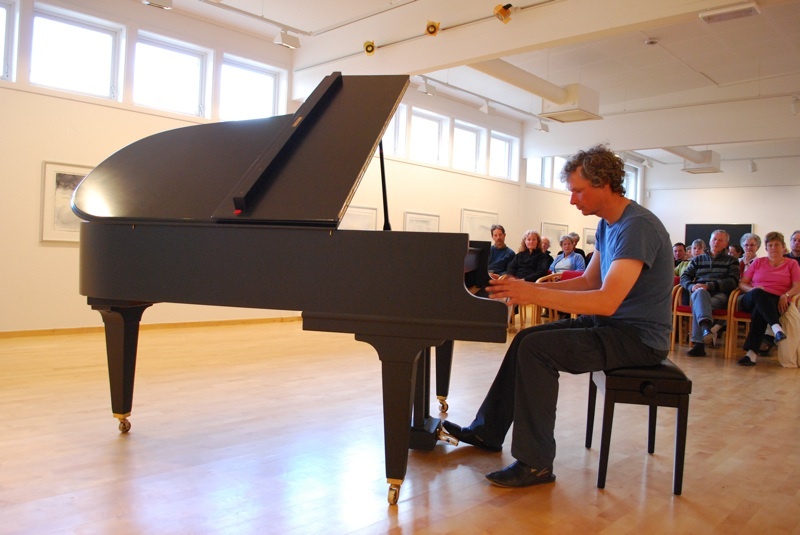 Maarten Regtien performs a solo jazz concert July 22 at Galleri Svalbard. He said years of improvising means certain concepts are always in his head, hence the ability to perform an audience-pleasing concert after more than a week in the wild. But a description of his style at his Web site (www.regtien.info) indicates it's not an overly contemplative process. "I have a distinctive style, but it is no longer my brain or my fantasy which stipulates what to play," he wrote. "For me it is as if my heart has a direct connection with my hands and commands these without intermediate." Regtien graduated from the University of Amsterdam in 1988 after focusing his studies on contemporary experimental music, but earns a living these days as an information technology contractor for Microsoft in the Netherlands. "The music he liked to write in general was regarded as extreme and 'too modern,'" his Web biography notes. "Not wanting to compromise, however, by writing 'acceptable' and in his ears ´boring´ music for a living, quickly the decision was made to a earn a living with a not-musical career and to compose in spare time." While his solo works can seem quaint to casual listeners, Regtien said he strives for a depth that requires attention to appreciate ("I hate background music"). Complexity is more easily found in numerous ensemble, orchestral, electronic and other compositions, with recordings, videos, scores and descriptions of many free available at his Web site. 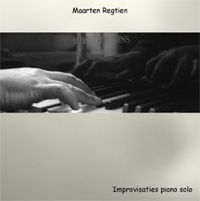 He also offers two albums, Improvisaties Piano Solo and Jazz Standards, at Russian-pirate-site prices (tracks are either free or about 10 cents each) at http://amiestreet.com/music/maarten-regtien. The Longyearbyen concert was Regtien's first in Norway. But unlike the hordes of musicians unwinding at hotel pubs into the wee hours before moving on to their next summer tour gig, his plans called for heading straight back to his tent to get out of those ambient winds in preparation for his next early morning encounter with ice and sports tape. "It's a heavy holiday," he said. All contents copyright 2009 by Icepeople or other copyright holders. Icepeople material may be reproduced elsewhere free of charge for noncommercial use. Contact Mark Sabbatini at marksabbatini@yahoo.com for information about anything else of seeming importance.